Based on the Emmy Award­-winning “genius” (The Guardian) web series, The Lizzie Bennet Diaries, this is a new novel starring Lizzie’s spunky sister Lydia as she navigates the joys and pitfalls of becoming an adult in the digital age. After her ex-boyfriend, George Wickham took advantage of Lydia’s newfound web-fame, betrayed her trust, and destroyed her online reputation, she’s no longer a naïve, carefree girl. Now, Lydia must work to win back her family’s trust and respect and find her place in a far more judgmental world. 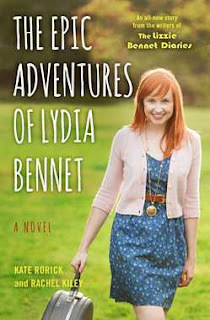 Told in Lydia’s distinctive, eccentric, and endearing voice, The Epic Adventures of Lydia Bennet picks up right where The Secret Diary of Lizzie Bennet left off and “offers a fresh take on Pride and Prejudice without ruining it” (The Washington Post, on The Secret Diary of Lizzie Bennet). Featuring fresh twists, wonderful new characters, and scores of hilarious texts, doodles, and tweets, The Epic Adventures of Lydia Bennet takes you behind the webcam and into the lives of your favorite sisters in a way that’s sure to satisfy existing fans and delight new ones. For this book, I have to admit that I wasn't really looking forward to reading it. Book 2 is Lydia's story and whenever I watched the movie I hated Lydia. She makes dumb decisions and I don't handle dumb well. Especially after reading book 1, I still didn't like Lydia because of her choices, but I said I would read the book so I did. Boy, am I glad I agreed to read this book for review! It was seriously so good, and I actually like and understand Lydia. To be honest, I found Lydia's story to be better than Lizzie's, because with Lizzie's I already knew what was going to happen. It's a re-telling. With Lydia, I've never been told her story so, it was all new to me. I loved how honest and real this book felt. I truly understood what Lydia was going through and although she did more dumb things in this book, I still ended up really liking her. I understood how these things could happen to someone, and I understood why she went off with Wickham in the first place. In the movie she is just a dumb, young child, but in this book there is a motive and a reason. It was still dumb, but at least we understood why. I also really liked where Lydia's story goes and the lessons she learns. I almost hope there is another book from Lydia's point of view to learn more, but I know that is doubtful. It was just so refreshing to end up really understanding, caring, and liking a character I have always hated. I wouldn't say it is easy, but I would say it is easier to write a book about character that already has it's personality laid out, it's harder to create one from scratch and I found the other characters that Rorick and Kiley created to be just as believable and well-developed. I am very, very happy that I decided to read this book. Lydia has always been a character I hated, but after reading this I actually understand, care, and like her a lot. All of the characters, especially the one's we have never met before, were all very well-developed and believable. I enjoyed Lydia's story a thousand times more than I thought I would and for once, I actually think book 2 in a series was better than book 1. Check this series out!